DKB, Inc. can provide engineered applications of insulation, barriers and jacketing to minimize noise from equipment, piping and ducts in an industrial or commercial setting. Insulation is often specified on mechanical systems and equipment to control noise within buildings and other facilities such as compressor stations, control rooms, and mechanical rooms. It is very important that sound sources be well identified in industrial settings. By knowing the sound insertion loss of insulation and jacketing material combinations, the expected noise reduction in the field can and should be estimated. 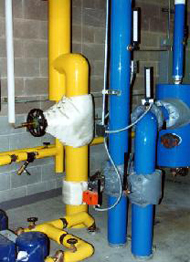 Noise radiating from pipes can be reduced by adding absorptive insulation and jacketing materials. A range of jacket weights and insulation thicknesses can be used to reduce noise. It is important that all sources of noise above desired levels receive acoustical treatment, beginning with the largest source or no improvement will be noticed. HVAC ductwork acts as a conduit for mechanical equipment noise and also carries noise from one office to another. As with pipes there are many applications from lining to wrap that should be considered for these systems.